Make no mistake, I have no problem with Natural Born Killers. It’s one of Oliver Stone’s best movies, has a great cast and some great performances. But as a fan of all things killer toy related in the horror field, as a fan of horror comedy and the Child’s Play series in general, I was probably destined to gravitate toward Bride of Chucky a little bit more. If you look at them on paper, they’re basically the same film. Both are road movies, both center on a romantic pairing of twisted killers who are slashing their way across the country, and both are focused on the media attention that comes along with that. The similarities between the two are striking. Both are satires, both are meant to carry a jet-black sense of humor. 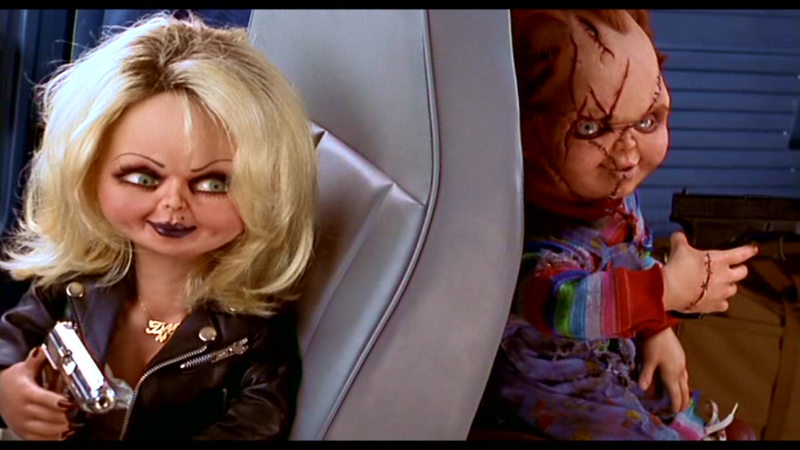 But if you think about it, the satire in Bride of Chucky might actually work better. Right from the beginning, the concept is absurd because the killers are dolls. It’s already a farce on that level. But the humor in Bride of Chucky doesn’t just come from the ridiculous nature of the premise and the title—it’s actually a very classical comedy when you look at the structure of it. There are two star-crossed lovers who want nothing more than to run away with each other, but things keep on going wrong, and each time something new happens they blame each other immediately. It’s a horrific spin on the romantic comedies of the ‘40’s and ‘50’s, made only funnier by the fact that the “misunderstanding” between the two lovers is that each one thinks the other is a serial killer. This also makes for a better commentary on media and sensational journalism, something that was hugely prevalent during the 1990’s, when both Bride of Chucky and Natural Born Killers were made. With Killers, Stone was looking at how these mass murderers are almost idolized as heroes, when they really are anything but. Bride of Chucky taps into that slightly by showing Chucky as this almost mythic doll who has gone onto become a sort of widespread urban legend. The focus isn’t so much on that, though, as it is centered on the whole media circus and how everything is turned into a big story, everything needs a hero and a villain. The facts are unimportant. The story is what counts. That’s where Bride of Chucky shines in its satire of sensational media reporting: The media are tracking Jesse and Jade—whose names could easily be a reference to Mickey and Mallory—assuming that one is a psychopath and the other is probably a hostage. They don’t even have the right killers. They don’t even begin to know what’s actually going on, which just makes the whole situation funnier. The film also adds some surprising layers to Chucky as a character. This was the first time in four movies we’d seen him be warm to absolutely anyone. Sure, he had played nice with Andy and we’d seen him pretend to be friends with Tyler to get what he wanted, but that’s a very different thing than what we see here. While it appears at first that this is just another one of Chucky’s manipulative relationships, although one he’s kept going for a long time. But that’s not the case. He legitimately cares for Tiffany, which the feature goes out of its way to show over and over again. It may not be a healthy relationship. It may be just as violent as anything else in the lives of supernatural killers, but even when it comes to fighting, they each hold their own and give as good as they get. It’s probably the most healthy relationship a guy like Chucky could ever hope to have. It’s surprisingly complex when compared to the relationship between Mickey and Mallory in Natural Born Killers. But the truth is that Mallory was a would-be victim who hero-worshipped the man who originally intended to kill her or developed Stockholm Syndrome. Fans are always looking for a dark, edgy couple to be the “face” of romance for the horror fandom. There are the cute, sweet romances of Jack and Sally in The Nightmare Before Christmas and of course Gomez and Morticia Addams, but not a whole lot for fans at the adult level. Mickey and Mallory have the aforementioned problems, The Joker and Harley Quinn are in an incredibly abusive relationship and intentionally so, so that young fans would be able to recognize an abusive situation, but that spun completely out of control. 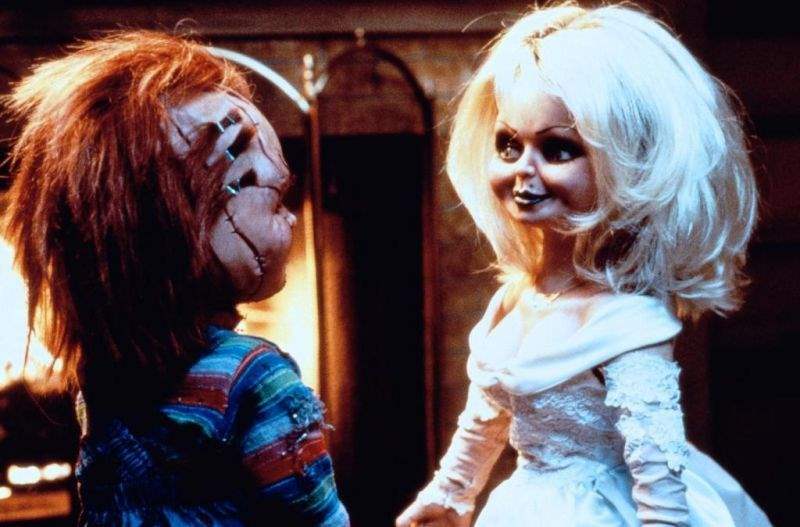 Chucky and Tiffany, even though they fight and kill each other and then wake up in the next movie and pretend nothing ever happened, do share a mutual respect of each other. Tiffany is the only person this little monster has ever sincerely apologized to. Their relationship is not healthy, but it is based on a mutual respect and a true admiration that exists between both parties and is not one-sided. This is not a case of Stockholm Syndrome, but rather two psychotic killers who happened to find and fall for each other. While Tiffany never stopped thinking about Chucky and eventually tracked down the doll, she was by all accounts an active serial killer on her own during the ten years following Chucky’s initial death. Unlike other movies, particularly franchise entries which seem to develop a following over time, Bride of Chucky has less fans than when it first came out. It was a hit at the box office and even won over some critics. But over time it’s been lumped in, I think, with Seed of Chucky, which had a similar comedic tone but took things way too far in the direction of total absurdity. While Bride is hilarious and built on set piece after set piece of comical situations, it at least takes its characters seriously. It manages to be funny, smart and fun at the same time, which is really the most you could ask for from the fourth film in a slasher series. So while I think both Bride of Chucky and Natural Born Killers are great in their own right, I find myself watching the former much more often. It’s the same story done both more and less complex at the same time, with a lot more laughs and a little more style.